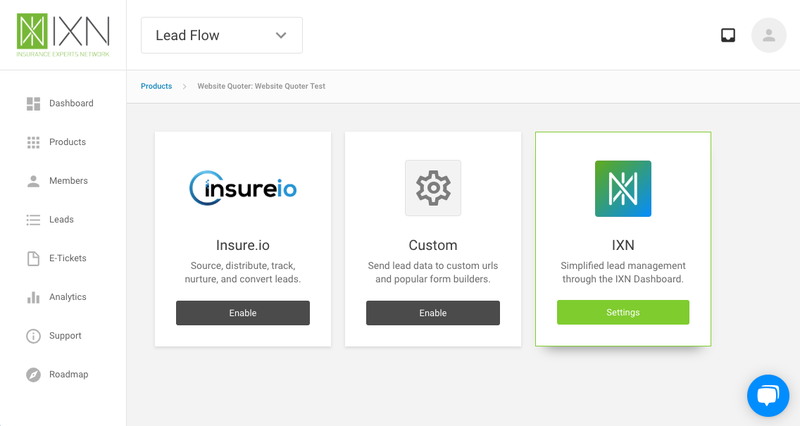 Our Website Quoter offers the option to collect leads generated from your quote engine using our IXN lead form, forms integrations, custom URLs, or CRM Integration. Depending on which method you select will determine where you access that information. When using our IXN lead form, your leads will be accessible using the "Leads" section of your Dashboard. You will be notified that those leads have been received via the dashboard and/or email. 5. Once in Lead Flow, navigate to the IXN card and select "Enable." This will take you to the settings for the lead form and email notifications. 6. Our website quoter offers the option to send yourself, employee, and/or business partner leads via email notifications at two different points during the quoting process. Partial Lead Notifications - This will send an email to you or other designated recipient(s) when an initial quote is run. 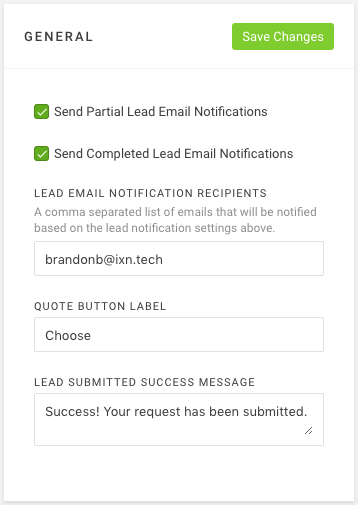 Completed Lead Notifications - Once a quote is selected by your potential client, and the additional information is submitted, another email will be sent to the designated recipient(s). Lead Email Notification Recipients - This is the email(s) designated to receive the partial and completed lead notifications. Additional emails can be added in a comma separated list. 7. You can also edit what fields are requested in the partial and completed leads. Please refer to the following guide for configuring the lead form fields. In the "Settings" area for your Website Quoter, you will see a card titled "General." On this card, you can designate an assigned member for the Website Quoter. 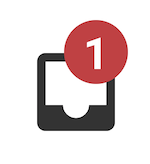 This member will automatically have any leads assigned to them in the "Leads" card as well as receive notifications in the inbox of their dashboard, in the upper right-hand corner. Paper Icon: By clicking the paper icon on the left-hand side of the lead, a modal will appear that displays any information collected about that specific lead including the product information if a quote was selected, and any information collected with the fields you have enabled. 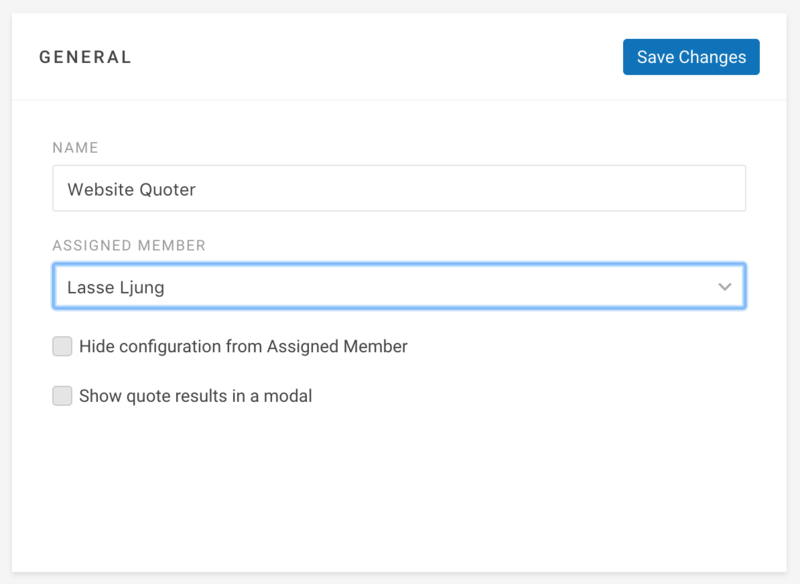 "Has Quote": When a lead is complete, meaning a product has been selected and a client has completed the quoting process, a green checkmark will appear. If it is only a partial lead, this column will be empty. Status: To keep track of the status of a lead, you can determine where that lead is in your sales process. Assigned Member: The assigned member will default to the member that is assigned to the website quoter. However, if an Admin or Sales Rep would like to reassign those leads, they can do so using this dropdown.